Will District Attorney Jeffrey Rosen fight for 9/11 truth and justice? Or, will he join the conspiracy of silence and of shunning and help cover up the 9/11 airport surveillance video fraud? UPDATE: As of 4 September 2012, Mr. Rosen has not responded to my fourth and final letter (dated 8 June 2012 and shown below). At this late stage, I am forced to conclude that the Talmudic Law of the Moser, whereby a Jew is prohibited from informing on another Jew to a non-Jew, is a possible explanation for the silence at the District Attorney's office. According to Mr. Rosen's published biography, he has served as the president of a large synogogue. Is he a Zionist covering for another Zionist? Is he protecting Michael Chertoff? Chertoff oversaw the US Department of Justice's handling of the bogus 9/11 "Dulles Airport" surveillance video, which is a very serious crime. Moreover, Chertoff has prospered from the fraud in many ways. For example, as a security consultant Chertoff has abused taxpayers who foot the bills for security upgrades at airports such as San José's Mineta International Airport. That would be in Mr. Rosen's jurisdiction. In the process of time, his silence will be tantamount to complicity. This is a demand for a response to my three previous attempts to bring to your attention very serious wrongdoing that has negatively impacted citizens of Santa Clara County, the nation and the world. My e-mail letter of 15 March 2012 was ignored. A handwritten note of 22 March left with your receptionist during a personal visit at your office was also ignored, as was a 10 April 2012 e-mail letter addressed to a Palo Alto law firm which was copied to your attention. In this and in all three previous communications I repeat my charge that the US Department of Justice under John Ashcroft and Michael Chertoff employed a demonstrably fake 9/11 “Dulles Airport” surveillance video as part of an elaborate ruse to frame Arabs for the psychopathic cybernetic crimes of 9/11. In all three communications I refer to my article “Dulles Airport” Shadow disproves US Government’s 9/11 Conspiracy Theory where you can see the proof of my heavy charge. The article is published on my website at www.show-the-house.com/id107.html. I remain confident that any fair and impartial jury or other group of citizens will find my facts, analysis and conclusions to be sound. For citizens here in Santa Clara County, California, the argument I present is rather simple. The 9/11 airport video fraud perpetrated by the US Department of Justice led to lucrative invasions of the Middle East, a security industry for the “homeland” and private mercenary armies abroad. Mr. Chertoff profits from this fraud as an expert on security. Therefore, any security measures undertaken by Santa Clara County as a direct or indirect result of Mr. Chertoff’s recommendations entail money payments fraudulently obtained directly or indirectly by Mr. Chertoff, whose Criminal Division at the US Department of Justice was an accessory or actual perpetrator in the chain of custody of evidence for the false and misleading 9/11 airport video. To be clear, this is the same video mentioned on page three of the 9/11 Commission Report and purported to have been made at Washington Dulles International Airport on the morning of 11 September 2001. You can obtain this video at http://www.vaed.uscourts.gov/notablecases/moussaoui/exhibits/prosecution.html. I discovered this fraud in July 2009 and for nearly three full years I have found myself enclosed by walls of silence and of shunning on the part of government officials and the news media. What I have long considered to be a “no brainer” has dramatically illustrated for me the meaning of the term “third rail issue.” Now I am asking you to exercise the manly virtue of responding to a letter that is admittedly quite troublesome on many levels. In urging you to answer, I can only bring to your attention what I strive to keep first and foremost in my own mind at all times and under difficult circumstances. This is a very serious matter involving the pursuit of historical truth and the proper administration of justice. I warn you and many others that cover-up of a damnable crime is a damnable crime. In the meantime, I am left wondering why you would want to join the conspiracy of silence and of shunning in this matter of the bogus 9/11 “Dulles Airport” surveillance video. Could it be that there is a mountain of circumstantial evidence indicating Zionist involvement in the crimes of 9/11? Could it be that public awareness of the bogus airport video will be a tipping point toward a new and a real investigation of 9/11? Could it be that a new and a real investigation of 9/11 will uncover Zionist involvement above and beyond Michael Chertoff’s handling of the fake 9/11 airport security video? A “deep chrono” indicates this might be the case. Consider the following. On 9 January 2012 I applied to become a civil grand juror for the June 2012-2013 term. In my application I express my yearning to exercise the juror’s prerogative of making a presentment with respect to the allegations I have made to you about Michael Chertoff and the bogus 9/11 airport video. There is no reply. Then, on 6-7-8 March 2012 Shimon Peres visits San Francisco and Silicon Valley, and on 7 March 2012 Judge Richard J. Loftus, the Presiding Judge of the State Superior Court in San Jose, issues an extension for applications for civil grand juror. Smelling a rat, I decide the best thing to do is contact you, which I did do with an e-mail letter on 15 March 2012. After no reply from you, on 22 March I made an impromptu visit to your office and asked to speak with you. When the receptionist told me you were not available, I sat down in the reception area and wrote by hand a one page letter addressed to you, which I returned to the receptionist who promised to forward it to you. No answer. Even after I copied to you a letter by e-mail to a Palo Alto law firm on 10 April 2012 there was only silence. Then I wrote to Judge Loftus on 7 May 2012. There is a long silence. Then President Obama visits San Francisco and Silicon Valley including an impromptu overnight stay in San Jose on 23-24 May 2012. On 25 May 2012 Judge Loftus finally breaks the ice with a terse letter thanking me and saying I am not among the chosen for the drawing of the civil grand jury later this month (copy appears below). So what am I to do? Travel the nation like Ringling Brothers with a Big Top Presentment? Two proverbs of Solomon come to mind as apt for the occasion: “To do justice and judgment is more acceptable to the Lord than sacrifice.” (21:3) And, “It is the glory of God to conceal a thing: but the honor of kings is to search out a matter.” (25:2) My striving to ascertain the truth about 9/11 and to expose the cover-up is a really valuable service to the nation. Will you block me by joining or maintaining the cover-up? 9/11 truth will be revolutionary. Let me be frank. Given your name “Rosen,” I guess that you are Jewish but don’t in fact know for sure. But going on the assumption that you are Jewish, I have to wonder if I am going up against the false and damaging insinuation that I am an anti-Semite because I am accusing a Zionist of very serious wrongdoing. So, to counter any such notion that you might have, let me give you a little background about myself. After my parents, the person who had the most positive effect on my childhood development was a New York City Police Department “cop” named Howard Lowenthal. “Uncle Hop” was a Jew, and he had as I remember him an uncanny resemblance to our current person of interest Michael Chertoff. I would not be surprised if it turns out that they are long-lost cousins from the same shtetl or ghetto in eastern Europe or Russia. I consider myself blessed to have known this man Howard Lowenthal and his kind and loving ways. From him my attitude toward Jews in general has always been very good. In this regard I must also tell you that my maternal grandfather Joseph Rempe ran Meckel’s grocery store on Rivington Street on the Lower East Side of Manhattan, on the current site of the Samuel Gompers Houses. Nearly all his customers were Jews, and most of them were right off the boat from Europe. To help them, my grandfather knew basic Yiddish expressions. He would have good fun with them by nailing a coin to the floor and laughing with them when new customers would try to pick it up. On a more serious note, the FBI used Meckel’s as a place to stake out the comings and goings of the Greenglass/Rosenberg spy ring at the Greenglass apartment right across the street. Though just a toddler at the time, I soon learned that there are Jews who are bad and there are Jews who are good. This was long, long before I learned about the Talmudic law of the Moser and then began to write about it, including an update on the Rosenbergs right after the 11 September 2008 Morton Sobell confession that they were all indeed Soviet spies despite decades of denial. For more on this see (www.show-the-house.com/id10.html.) So my Bible-reading grandfather Joseph and I walked in the footsteps of the great one Meyer Lansky and his ilk but we nonetheless kept a very short A-list of favorite Jews beginning with Moses and ending with Jesus. Posted by Jeff Rosen on Wed May 16 05:42:53 2012, in response to USS Liberty Cover Up - Full Documentary - "The Loss Of Liberty", posted by monorail on Wed May 16 00:30:43 2012. Mr. Rosen, you are sadly mistaken and too eager to repeat the standard Zionist-generated reply without doing your own research on the matter. On the other hand, the President of the USS Liberty Naval Court of Inquiry, the late Admiral Isaac Kidd, told me in telephone conversations in the early 1990s that the USS Liberty investigation over which he had presided was “entirely shipboard”; i.e., it was an ex parte proceeding in which only the victims of the attack were examined but not the perpetrators. As a District Attorney, I think you can appreciate this distinction, and you would be rather insecure in your tenure as DA were you to go about your business by conducting ex parte investigations. Furthermore, the Legal Counsel of the USS Liberty Naval Court of Inquiry, the late Captain Ward Boston, told me in telephone conversations that LBJ ordered a cover-up. He also told me of his advice to put the military personnel who were responsible for the attack under examination, and that Admiral Kidd was frustrated in his attempts to go in that direction. Captain Boston repudiated the findings of the USS Liberty Naval Court of Inquiry and cited instances where there were significant alterations made to the report after he had signed and submitted it. The USS Liberty website www.gtr5.org gives Captain Boston’s affidavit as well as many other testimonies of high-ranking officials in the US Government which cast shadows of doubt over the official US Government account of the attack on the USS Liberty. Contrary to what you say, there has never been a full and fair investigation of the attack on the USS Liberty. There have been a number of investigations of severely limited scope, all of which cite the flawed Naval Court of Inquiry that was later rejected by its own legal counsel. All of these severely limited investigations were ex parte investigations like the Naval Court of Inquiry itself; none examined the Israeli attackers or their commanders or other key personnel. As for the Yerushalmi Report from the Israeli side, which is the only report to have been formally delivered by the Ambassador of Israel to President Johnson’s Zionist aides at the White House, there are very many unanswered questions raised in its contents. In my opinion, the Government of Israel was blackmailing our US Government with exposure of clandestine submarine activity if the US investigation into the USS Liberty incident went too far. This is evident to me in the opening paragraphs of the report. Besides, LBJ was a step away from criminal charges for murder in Texas, and he owed key Zionists “big time” for his legal battle against voter fraud charges in his rigged election to the U. S. Senate. What better gift could you give the Zionists under these circumstances? Other people’s land, and the water under it! As for motive, in 1991 I described a secret deal to let the Zionists capture Syria’s Golan Heights, which the USS Liberty – an audio electromagnetic surveillance ship (“spy ship”) – threatened to expose. To ensure secrecy, a decision was made to remove the ship, which was only partially accomplished. Even so, with the USS Liberty’s eavesdropping, recording and transmission capabilities neutralized, the IDF managed to overrun the “Little Maginot Line” atop Syria’s Golan Heights in less than 24 hours, a feat that is impossible to believe unless effective resistance by the Syrian Armed Forces was somehow withdrawn. Two years later, the then Syrian Minister of Defense during the Six Day War, Hafez al Asad, became the only man in world history to attain the lofty position of head of state after having lost a significant amount of his nation’s sovereign territory, the Golan Heights. Syro-Zionist collusion has been a hidden impediment to the so-called Middle East peace process ever since, as the secret deal could not be reported or invoked as an official treaty at the United Nations. Bashar al-Asad appears to me to be out of the loop, but his father’s right hand man, the USA’s “King of Syria-in-waiting” Abdul Halim Khaddam, is ready to maintain the decades-old status quo by advocating regime change in Syria from his luxurious exile in Paris. (For more, please see www.show-the-house.com/id5.html.) Khaddam’s allies, the Saudi royal family, to whom President Obama has bowed belt-buckle low, are renting our flag just the way the Kuwaitis did during the first Gulf War. Only this time the USA will stumble badly. In straight talk, Peres’s message is that United Nations Security Council Resolution 242 has no bearing at all insofar as the Golan Heights are concerned. By supporting this cruel and crazy policy, the USA is going back on its solemn word to uphold the Charter of the United Nations and its treaty obligations as mandated by the Constitution of the United States. Now that I know for sure that the US Department of Justice under John Ashcroft and Michael Chertoff framed Arabs with a bogus 9/11 “Dulles Airport” surveillance video, I tend to see the unprecedented cancellation of the Judicial Conference the very same morning as very likely deliberate and part of an over-all design initiated when, according to then Secretary of the Treasury Paul O’Neill, President George W. Bush instructed his National Security Council at the first meeting in February 2001 to “find me a way to go into Iraq.” In this regard, I must also ask, how could a major news network report an explosion near the Supreme Court building (where the Judicial Conference was being held) when no one else heard it? (The link given in the previous paragraph contains a link to an insider’s report at the Judicial Conference written by Judicial Fellow and Professor of Law at the University of Calgary, Peter Bowal, who does not mention an explosion.) This report of an explosion near the Supreme Court building was carried live by CBS radio station 1010 WINS in New York. 1010 WINS provided the soundtrack for Rick Siegel’s video of the building collapses at the World Trade Center on 9/11. Besides showing that explosions immediately preceded the collapse of each of the Twin Towers, which correspond with off-the-chart seismic spikes at Columbia University’s Lamont Doherty Earth Observatory, 1010 WINS has also preserved for the record an apparently calculated lie about an explosion near the Supreme Court. But how can this be explained? To conclude, let me remind you, Mr. Rosen, of the importance of video evidence. The San Jose Mercury News has described in detail how you sacked a prosecutor for withholding video evidence. Don’t you think a jury would find it rather interesting that Michael Chertoff used a bogus airport surveillance video to fool the American people and other nations into waging war abroad and then turned his expertise on security matters into a means to rob taxpayers? Don’t you think a jury ought to examine this video and be given a chance to follow the logic and intuitive thinking leading to my discovery and conclusion of fraud? There is an old expression that goes: “Fool me once, shame on you; fool me twice, shame on me.” What, then, can be said of Americans who have been tricked about Pearl Harbor and the Tonkin Gulf incident? The published record is clear that Zionist Neoconservatives were wishing for a “new Pearl Harbor” six months before George W. Bush’s instructions to his National Security Council to “find me a way to go into Iraq” and a full year before 9/11 itself. Don’t you think a jury would benefit the county, the nation and the world with this reality check? What about the sage advice that goes: “If you see something, say something.” Isn’t this what I am doing? What conclusions can be drawn when the “proper authorities” do not have eyes to see or ears to hear? For me personally, can you imagine what that’s like? My boss at the New York Regional Office of the US Bureau of the Census, Marion Britton, disappeared on United Flight 93 on the morning of 9/11, and she is actually the one who put me on this quest for truth and justice. It all began when I noticed there were no routine airport surveillance video tapes of her or any of the other passengers or alleged hijackers at Liberty Newark International Airport that morning. But this is just the tip of the iceberg! From the standpoint of our “free marketplace of ideas,” I think I’ve paid my dues with outstanding contributions in the fields of citizen journalism and good old detective work. If President George W. Bush could offer $25,000,000.00 for Osama Bin Laden, dead or alive, then I deserve $50,000,000.00 for proving that George W. Bush had no evidence to offer the Taliban in late September 2001 when the Government of Afghanistan offered to deliver Osama Bin Laden upon presentation of evidence that he was responsible for the crimes of 9/11. Handing over a bogus 9/11 airport surveillance video would have made George W. Bush the subject of an investigation in the very beginning. That was not to be! But believe in the old saying, “Better late than never.” George W. Bush is a person of interest in a new and a real investigation of 9/11. In the meantime, we can break the ice by arresting and charging Michael Chertoff. I hope you are with me. 09 January 2012 Grand Juror application submitted at Superior Court of California in San Jose in which presentment of 9/11 airport video fraud by Michael Chertoff is previewed. 19 January 2012 The JTA announces March visit of Israeli President Shimon Peres to Silicon Valley. 05 March 2012 President of Israel Shimon Peres visits San Jose in Silicon Valley. 06 March 2012 President of Israel Shimon Peres visits Palo Alto in Silicon Valley and San Francisco. 07 March 2012 President of Israel Shimon Peres visits Mountain View in Silicon Valley. 07 March 2012 Presiding Judge Richard Loftus announces extension for deadline for Grand Juror applications. 08 March 2012 President of Israel Shimon Peres concludes visit to Silicon Valley. 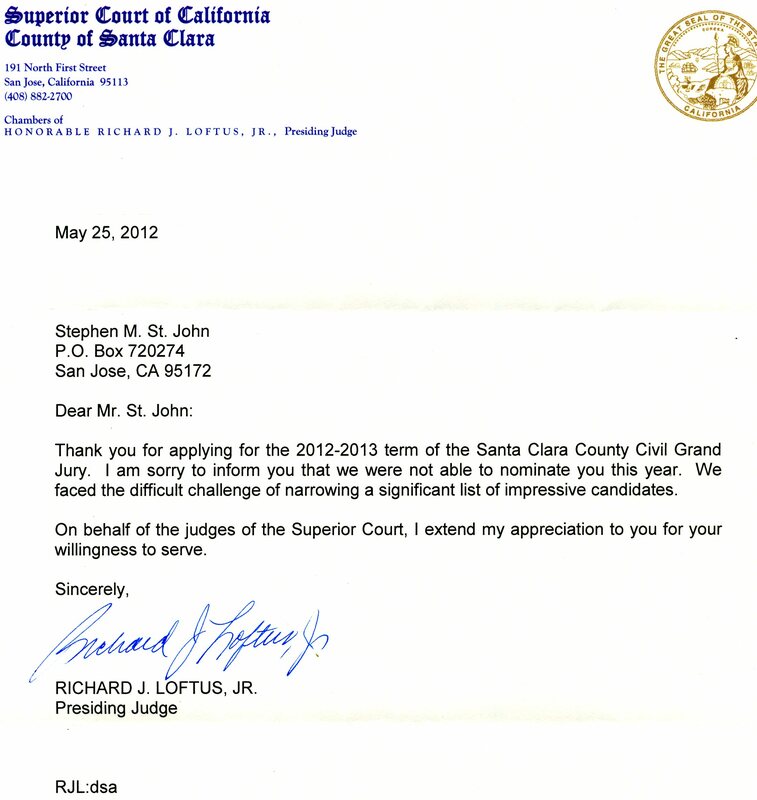 15 March 2012 Letter e-mailed to Santa Clara County District Attorney Jeffrey Rosen. 22 March 2012 Handwritten letter hand-delivered to District Attorney Jeffrey Rosen's receptionist. 10 April 2012 Designated copy of letter to a law firm in Palo Alto e-mailed to DA Jeffrey Rosen. 07 May 2012 Letter sent by US Postal Service to Presiding Judge Richard Loftus. 23 May 2012 President Barack Obama cancels event in Palo Alto and arrives for overnight stay in San Jose. 24 May 2012 President Barack Obama departs from San Jose and Silicon Valley before noon. 25 May 2012 Judge Loftus finally replies to my letter of 7 May. 08 June 2012 Fourth and probably final letter to DA Jeffrey Rosen, as shown above. I have good news and I have bad news. Let me give you the good news first. From this article I infer that if it is possible for the US Government to rescue the pension plan of what is arguably an unregistered (and therefore illegal) agent of a foreign government, then it is also possible for the US Government to be guarantor of pensions for police officers who daily put their lives on the line as they protect and serve the people! It is time to think outside the box and work with federal officials on the pension problem. And now I come to the bad news. With the exception of Mr. Unland, all of you have ignored my previous communications about my 2009 discovery of major fraud in the US Government’s official account of 9/11. As with the Anti-Defamation League of B’nai B’rith, which disparages researchers who contest the findings of the 9/11 Commission Report, you Mr. Mayor, and you Mr. Chief of Police, and you Mr. District Attorney, are stones in the wall of silence and of shunning that I have encountered for well over three years. Having exercised my right and duty to contact the proper authorities and show them that the purported 9/11 “Dulles Airport” surveillance video is beyond any doubt a total fake, I am forced to conclude that our system is totally corrupt at national, state and local levels. The general failure to confront a very grave matter affecting millions of people around the globe is the result of dishonesty, ignorance, stupidity and cowardice. But let me try one more time. If you believe our government about 9/11, then you must also believe that the sun rose near the north cardinal point of the compass in Herndon, Virginia on the morning of 9/11, as I have demonstrated in my article “Dulles Airport” Shadow disproves US Government’s 9/11 Conspiracy Theory on my website at www.show-the-house.com/id107.html. Here’s the spiel: It so happens that former Attorney General John Ashcroft and former Assistant Attorney General Michael Chertoff oversaw handling of this bogus 9/11 airport video. They are integral links in the chain of custody of evidence for this treasonous war mongering fraud, which also leads to other perpetrators and accessories of 9/11. Beyond that, as I have repeatedly tried to communicate to you, Mr. Rosen, Chertoff has profited from the fraud as a security consultant, and therefore very likely benefited from security upgrades undertaken at San José Mineta International Airport. Both elements constitute good grounds for his arrest and prosecution. Our nation will benefit from a good jolt of transparency and accountability. Your prompt action would make a swell October surprise and enliven the presidential debates. Of course the folks at the ADL will shriek their heads off and dry up and blow away. At least they will have a nice consolation prize; namely a comfortable retirement with guaranteed pensions! WASHINGTON (JTA) -- The Pension Benefit Guarantee Corporation, the government agency that protects retirees from failed pension plans, is assuming control of benefits for employees of B'nai B'rith International. "The agency stepped in because B'nai B'rith wouldn't have been able to pay its bills or stay in business unless the plan was terminated," PBGC said in a Sept. 11 posting on its blog. The posting said that B'nai B'rith's pension plan ended as of April 30 2011 and that PBGC "will pay all pension benefits earned by the organization's retirees up to the legal limit of $54,000 a year for a 65-year-old." The plan affects 500 current and future retirees, the posting said. Business Insurance, a trade publication, on Thursday quoted a PBGC spokesman as saying that the plan has $55.6 million in liabilities and $30.1 million in assets. A B'nai B'rith spokeswoman did not immediately respond to emails sent late at night seeking comment. Click here for complete coverage on the 2012 elections from JTA.